This posts continues on directly from my last post, working through the book The Limits to Growth one chapter at a time, summarizing it and offering my thoughts on what it has to say. 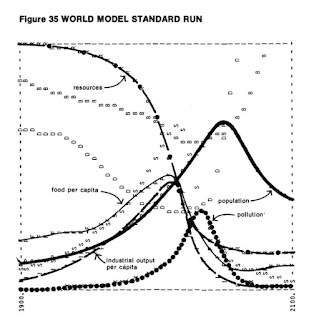 The graphic to the right is the "standard" run of the World 3.0 model, for which it is most famous. More on this soon—the graphic is just here so that when I post links to Facebook a graphic other than my ugly mug shows up. In this chapter, the authors describe the formal model that they used in an attempt to understand the complex world system. The purpose of the model is to aid in study of the behaviour modes of the system, that is the tendencies of the variable in the system (population, capital, food, resources and pollution) to change in certain characteristic ways as time passes. For example, it is well known that a population growing in a limited environment can behave in several different ways. It can adjust smoothly to an equilibrium below the environmental limit by means of a gradual decrease in growth rate, as shown in A below. It can over shoot the limit and then die back again in either a smooth or an oscillatory way, also as shown in B and C. Or it can overshoot the limit and in the process decrease the ultimate carrying capacity by consuming some necessary nonrenewable resource, as in D. This behavior has been noted in many natural systems. For instance, deer or goats, when natural enemies are absent, often overgraze their range and cause erosion or destruction of the vegetation. A major purpose in constructing the world model has been to determine which, if any, of these behavior modes will be most characteristic of the world system as it reaches the limits to growth. This process of determining behavior modes is "prediction" only in the most limited sense of the word. 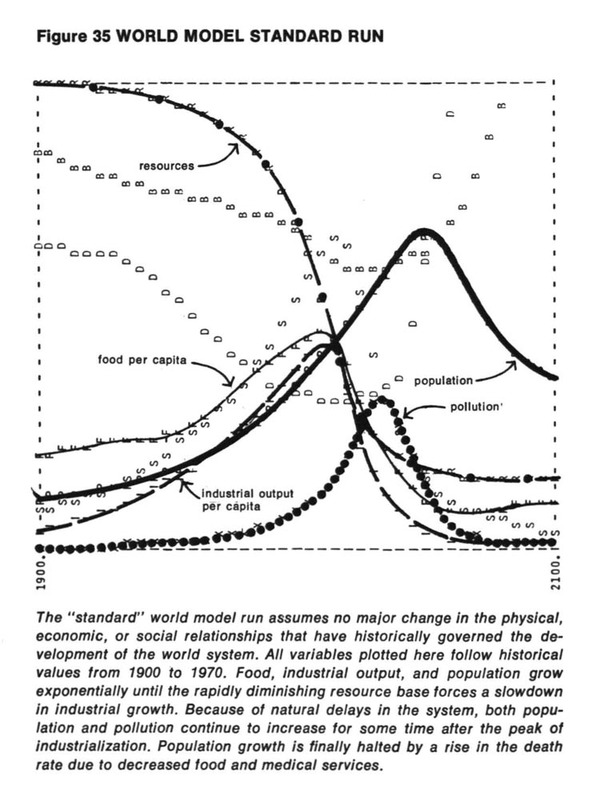 The output graphs reproduced later in this book show values for caveats about the system dynamic model world population, capital, and other variables on a time scale that begins in the year 1900 and continues until 2100. These graphs are not exact predictions of the values of the variables at any particular year in the future. They are indications of the system's behavioral tendencies only. Please note that the authors are claiming only "the most limited" predictive capabilities for their dynamic system model. They go on at some length about this and acknowledge that the model is extremely simplified. The whole world represented by a single general population, a single class of long lived globally distributed pollutants and a single generalized resource—this is necessary to keep the model understandable. They admit that this limits the information that can be gained from the model. National boundaries are not recognized. 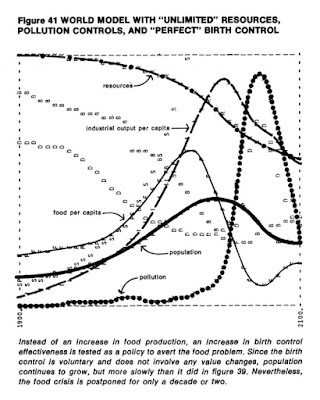 Distribution inequalities of food, resources, and capital are included implicitly in the data but they are not calculated explicitly nor graphed in the output. World trade balances, migration patterns, climatic determinants, and political processes are not specifically treated. Other models can, and we hope will, be built to clarify the behavior of these important subsystems. The authors describe 4 steps they took in building the model. 1. We first listed the important causal relationships among the five levels and traced the feedback loop structure. To do so we consulted literature and professionals in many fields of study dealing with the areas of concern-demography, economics, agronomy, nutrition, geology, and ecology, for example. Our goal in this first step was to find the most basic structure that would reflect the major interactions between the five levels. We reasoned that elaborations on this basic structure, reflecting more detailed knowledge, could be added after the simple system was understood. 2. We then quantified each relationship as accurately as possible, using global data where it was available and characteristic local data where global measurements had not been made. 3. With the computer, we calculated the simultaneous operation of all these relationships over time. We then tested the effect of numerical changes in the basic assumptions to find the most critical determinants of the system's behavior. 4. Finally, we tested the effect on our global system of the various policies that are currently being proposed to enhance or change the behavior of the system. The current state of knowledge about casual relationships in the world ranges from complete ignorance to extreme accuracy. The relationships in the world model generally fall in the middle ground of certainty. We do know something about the direction and magnitude of the causal effects, but we rarely have fully accurate information about them. To illustrate how we operate on this intermediate ground of knowledge, we present here three examples of quantitative relationships from the world model. One is a relationship between economic variables that is relatively well understood; another involves sociopsychological variables that are well studied but difficult to quantify; and the third one relates biological variables that are, as yet, almost totally unknown. Although these three examples by no means constitute a complete description of the world model, they illustrate the reasoning we have used to construct and quantify it. They go on to discuss the three examples: per capita resource use (well understood), desired birth rate (well studied but difficult to quantify) and pollution effect on lifetime (almost totally unknown), describe the assumption they have made. They then discuss the usefulness of the model, given its limitations. 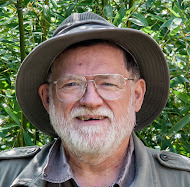 First, we hope that by posing each relationship as a hypothesis, and emphasizing its importance in the total world system, we may generate discussion and research that will eventually improve the data we have to work with. This emphasis is especially important in the areas in which different sectors of the model interact (such as pollution and human lifetime), where interdisciplinary research will be necessary. Second, even in the absence of improved data, information now available is sufficient to generate valid basic behavior modes for the world system. This is true because the model's feedback loop structure is a much more important determinant of overall behavior than the exact numbers used to quantify the feedback loops. Even rather large changes in input data do not generally alter the mode of behavior, as we shall see in the following pages. Numerical changes may well affect the period of an oscillation or the rate of growth or the time of a collapse, but they will not affect the fact that the basic mode is oscillation or growth or collapse. Since we intend to use the world model only to answer questions about behavior modes, not to make exact predictions, we are primarily concerned with the correctness of the feedback loop structure and only secondarily with the accuracy of the data. Of course when we do begin to seek more detailed, short-term knowledge, exact numbers will become much more important. Third, if decision-makers at any level had access to precise predictions and scientifically correct analyses of alternate policies, we would certainly not bother to construct or publish a simulation model based on partial knowledge. Unfortunately, there is no perfect model available for use in evaluating today's important policy issues. At the moment, our only alternatives to a model like this, based on partial knowledge, are mental models, based on the mixture of incomplete information and intuition that currently lies behind most political decisions. A dynamic model deals with the same incomplete information available to an intuitive model, but it allows the organization of information from many different sources into a feedback loop structure that can be exactly analyzed. Once all the assumptions are together and written down, they can be exposed to criticism, and the system's response to alternative policies can be tested. And now, at last, we get to actual behaviour of the world model, represented in a series of graphs based on varying assumptions. I can hardly avoid commenting that the graphs say a great deal about the primitive state of graphics software in the early 1970s. The horizontal scale in each of the figures shows time in years from 1900 to 2100. Each of these variables is plotted on a different vertical scale. they deliberately omitted the vertical scales and made the horizontal time scale somewhat vague because they wanted to emphasize the general behavior modes of these computer outputs, not the numerical values, which are only approximately known. The scales are, however, exactly equal in all the computer runs presented here, so results of different runs may be easily compared. The first is the famous (infamous?) 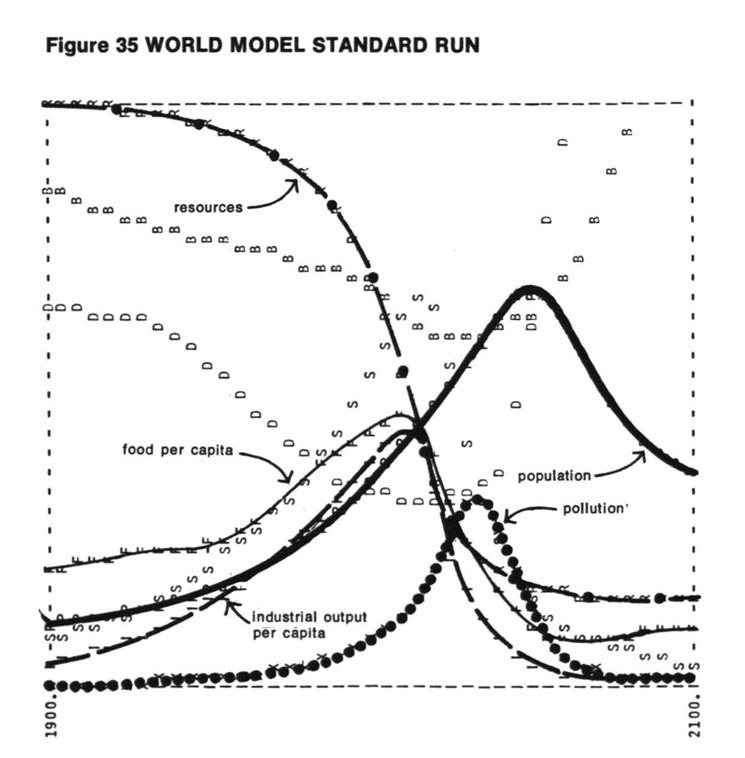 "standard run", Figure 35, which is based on the assumption that there will be in the future no great changes in human values nor in the functioning of the global population-capital system as it has operated for the last one hundred years. The behavior mode of the system shown in figure 35 is clearly that of overshoot and collapse. 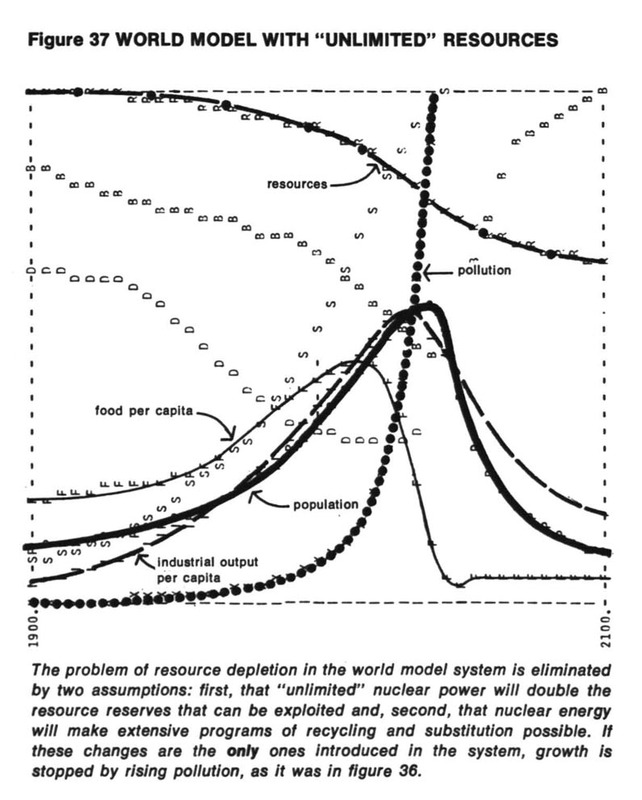 In this run the collapse occurs because of nonrenewable resource depletion. The industrial capital stock grows to a level that requires an enormous input of resources. In the very process of that growth it depletes a large fraction of the resource reserves available. As resource prices rise and mines are depleted, more and more capital must be used for obtaining resources, leaving less to be invested for future growth. Finally investment cannot keep up with depreciation, and the industrial base collapses, taking with it the service and agricultural systems, which have become dependent on industrial inputs (such as fertilizers, pesticides, hospital laboratories, computers, and especially energy for mechanization). For a short time the situation is especially serious because population, with the delays inherent in the age structure and the process of social adjustment, keeps rising. Population finally decreases when the death rate is driven upward by lack of food and health services. The exact timing of these events is not meaningful, given the great aggregation and many uncertainties in the model. It is significant, however, that growth is stopped well before the year 2100. We have tried in every doubtful case to make the most optimistic estimate of unknown quantities, and we have also ignored discontinuous events such as wars or epidemics, which might act to bring an end to growth even sooner than our model would indicate. In other words, the model is biased to allow growth to continue longer than it probably can continue in the real world. We can thus say with some confidence that, under the assumption of no major change in the present system, population and industrial growth will certainly stop with the next century, at the latest. 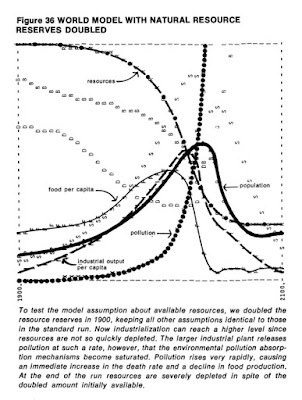 The collapse in Figure 35 is the result of a resource crisis, even though it is based on the optimistic assumption of a static resource reserve of 250 years. But let's be even more optimistic and assume that new discoveries or advances in technology can double the amount of resources economically available. A computer run under that assumption is shown in figure 36. The overall behavior mode in figure 36—growth and collapse—is very similar to that in the standard run. In this case the primary force that stops growth is a sudden increase in the level of pollution, caused by an overloading of the natural absorptive capacity of the environment. The death rate rises abruptly from pollution and from lack of food. At the same time resources are severely depleted, in spite of the doubled amount available, simply because a few more years of exponential growth in industry are sufficient to consume those extra resources. Is the future of the world system bound to be growth and then collapse into a dismal, depleted existence? Only if we make the initial assumption that our present way of doing things will not change. We have ample evidence of mankind's ingenuity and social flexibility. There are, of course, many likely changes in the system, some of which are already taking place. The Green Revolution is raising agricultural yields in nonindustrialized countries. Knowledge about modern methods of birth control is spreading rapidly. Let us use the world model as a tool to test the possible consequences of the new technologies that promise to raise the limits to growth. Of course, there are always technological optimists eager to explain how we can overcome the limits to growth. In this chapter, several additional runs of the world model are presented, each an attempt to overcome one or more of the limits which cause collapse in Figures 35 and 36. Let us assume, however, that the technological optimists are correct and that nuclear energy will solve the resource problems of the world. The result of including that assumption in the world model is shown in figure 37. To express the possibility of utilizing lower grade ore or mining the seabed, we have doubled the total amount of resources available, as in figure 36. We have also assumed that, starting in 1975, programs of reclamation and recycling will reduce the input of virgin resources needed per unit of industrial output to only one-fourth of the amount used today. Both of these assumptions are, admittedly, more optimistic than realistic. 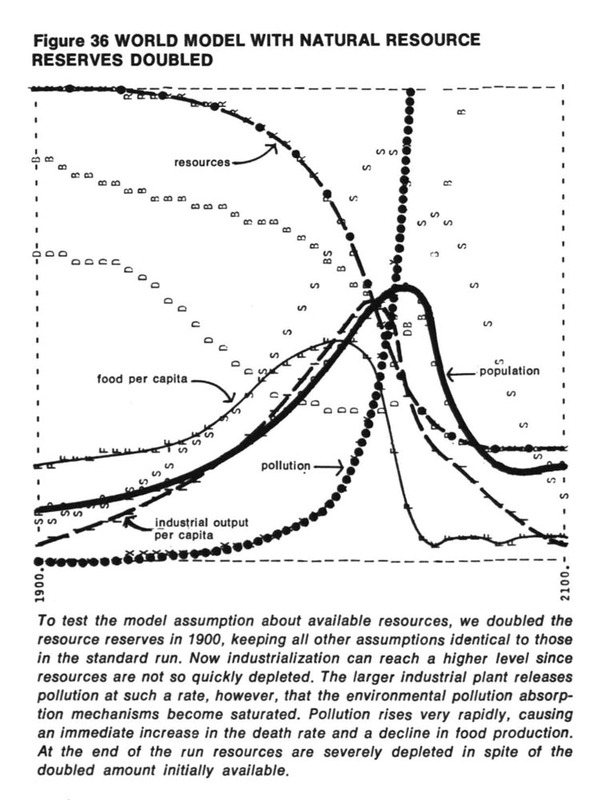 In figure 37 resource shortages indeed do not occur. Growth is stopped by rising pollution, as it was in figure 36. The absence of any constraint from resources allows industrial output, food, and services to rise slightly higher than in figure 36 before they fall. Population reaches about the same peak level as it did in figure 36, but it falls more suddenly and to a lower final value. "Unlimited" resources thus do not appear to be the key to sustaining growth in the world system. 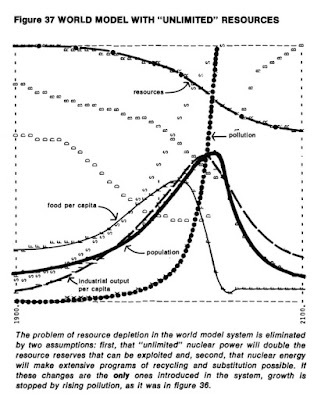 Apparently the economic impetus such resource availability provides must be accompanied by curbs on pollution if a collapse of the world system is to be avoided. OK, if pollution is the problem, what if we use technology to control pollution? As figure 39 shows, the pollution control policy is indeed successful in averting the pollution crisis of the previous run. 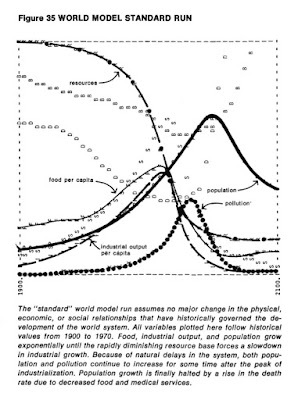 Both population and industrial output per person rise well beyond their peak values in figure 37, and yet resource depletion and pollution never become problems. The overshoot mode is still operative, however, and the collapse comes about this time from food shortage. As long as industrial output is rising in figure 39, the yield from each hectare of land continues to rise (up to a maximum of seven times the average yield in 1900) and new land is developed. At the same time, however, some arable land is taken for urban-industrial use, and some land is eroded, especially by highly capitalized agricultural practices. Eventually the limit of arable land is reached. 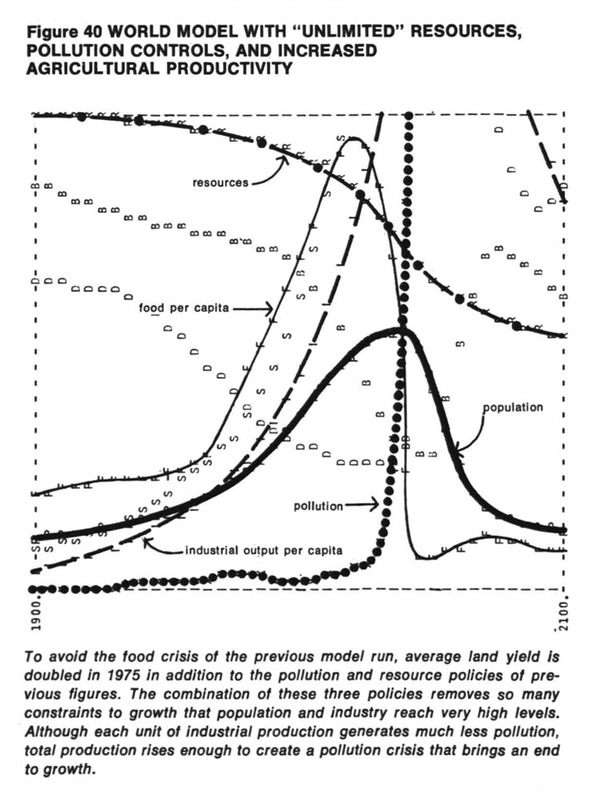 After that point, as population continues to rise, food per capita decreases. 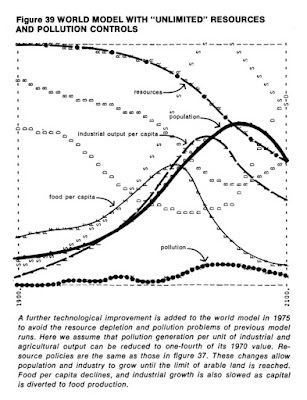 As the food shortage becomes apparent, industrial output is diverted into agricultural capital to increase land yields. Less capital is available for investment, and finally the industrial output per capita begins to fall. When food per capita sinks to the subsistence level, the death rate begins to increase, bringing an end to population growth. OK, if too little food is the problem, what if we increase agricultural yields? In figure 40 we assume that the normal yield per hectare of all the world's land can be further increased by a factor of two. The result is an enormous increase in food, industrial output, and services per capita. Average industrial output per person for all the world's people becomes nearly equal to the 1970 US level, but only briefly. Although a strict pollution control policy is still in effect, so that pollution per unit of output is reduced by a factor of four, industry grows so quickly that soon it is producing four times as much output. Thus the level of pollution rises in spite of the pollution control policy, and a pollution crisis stops further growth, as it did in figure 37. OK, if that doesn't work, what if we had perfect birth control? 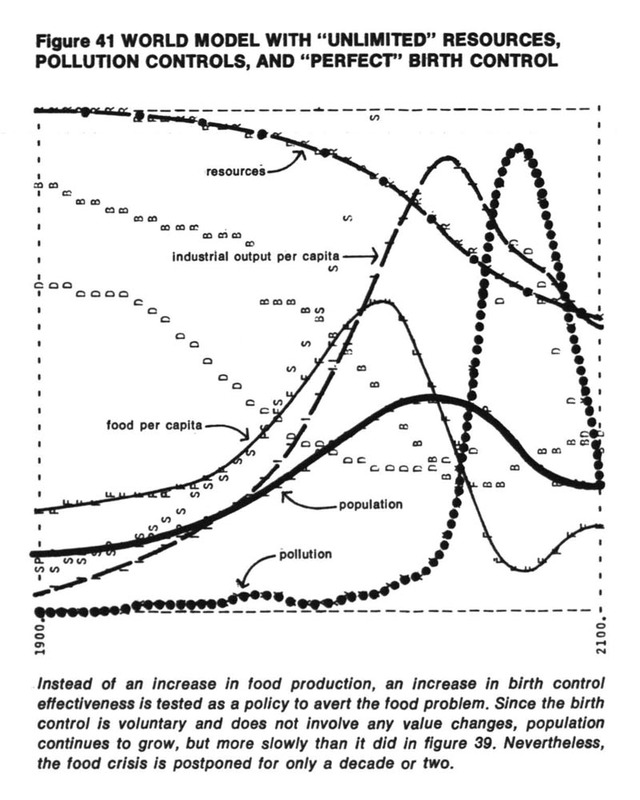 Figure 41 shows the alternate technological policy-perfect birth control, practiced voluntarily, starting in 1975. The result is not to stop population growth entirely because such a policy prevents only the births of unwanted children. The birth rate does decrease markedly, however, and the population grows more slowly than it did in figures 39 and 40. 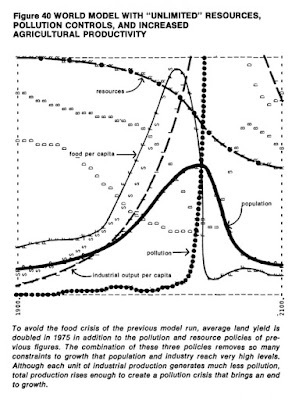 In this run growth is stopped by a food crisis occurring about 20 years later than in figure 39. Or, what if we had both increased agricultural yield and perfect birth control? In figure 42 we apply increased land yield and perfect birth control simultaneously. Here we are utilizing a technological policy in every sector of the world model to circumvent in some way the various limits to growth. The model system is producing nuclear power, recycling resources, and mining the most remote reserves; withholding as many pollutants as possible; pushing yields from the land to undreamed-of heights; and producing only children who are actively wanted by their parents. The result is still an end to growth before the year 2100. In this case growth is stopped by three simultaneous crises. Overuse of land leads to erosion, and food production drops. Resources are severely depleted by a prosperous world•population (but not as prosperous as the present US population). Pollution rises, drops, and then rises again dramatically, causing a further decrease in food production and a sudden rise in the death rate. The application of technological solutions alone has prolonged the period of population and industrial growth, but it has not removed the ultimate limits to that growth. 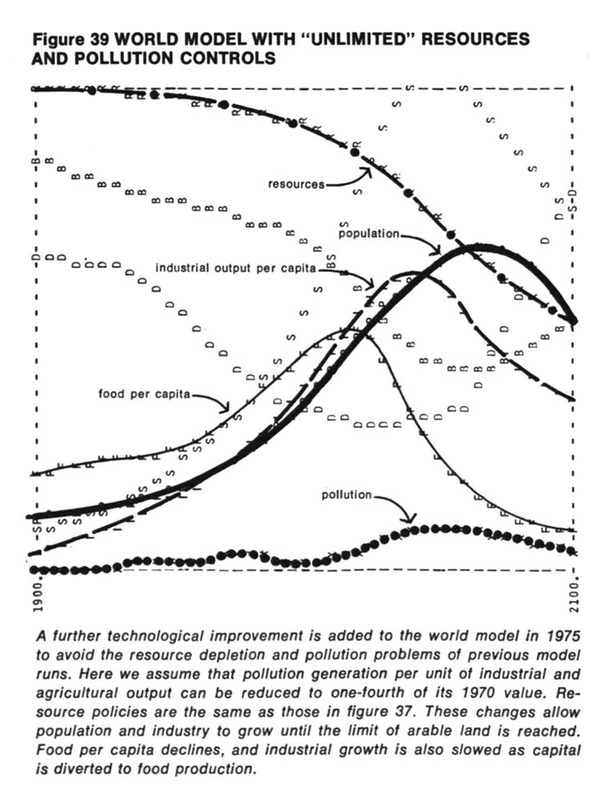 I have discussed this with many techo-optimists who point out that, with enough energy and technology, the problems in Figure 42 (and many others) can be overcome, allowing prosperity to spread worldwide and increase indefinitely. Of course, I happen to doubt that we can find enough energy and develop enough technology, but even if we do there is still a problem. All the energy that we use ends up as waste heat. This isn't something we are doing wrong—it's just how the world works. Tom Murphy discusses this in detail in a post at his blog "Do The Math". This a framed as a discussion between a physicist and an economist and I find it quite entertaining. The gist of it, though, is that while currently the amount of waste heat is small enough that it isn't much of a problem, as it increases it will become an even worse problem than the climate change we are experiencing because of the greenhouse effect. Yes, there are ways to minimize (but not eliminate) temperature increases due to waste heat. Ultimately though, as growth continues, if we are clever enough to find ways around all the other limits this will be the limit that gets us. But I digress—time to get back to The Limits to Growth. The rest of this chapter is spent discussing the implications of the model runs we've been looking at. But I've gone on long enough already, so we'll continue with that in my next post. As an aid to those who are reading this whole series of "Limits to Growth" posts, here is a complete set of links. I don't think any of these scenarios reflect the likelihood of Global Warming. There seems to be little hope of stopping Global Warming and the hostile weather that will come with it. We will see continual reductions in the Global Food supply so the "carrying capacity" is going to drop each year. Its also likely that we could have serious wars (possibly with nuclear weapons) over water. This will cause disruptions in the graphs. If the impact of Global Warming is left out of the graphs, I am afraid they are not reflecting reality. Actually, Mike, the growing level of CO2 in the atmosphere is discussed in the book under the heading of pollution (Figure 15, which I didn't include--trying to make the review shorter than the book). So I think they were aware of and thinking about global warming. In the follow on book, "Limits to Growth, the 30 year update", climate change is specifically discussed. In any case, ignoring climate change would make the book too optimistic. So it sound like you agree with me that, on the whole, The Limits To Growth was too optimistic. Most of its critics have felt just the opposite. But I do agree, climate change will indeed reduce the carrying capacity of the planet and make some sort of collapse even more likely.